Gabrielle Benefield talks about Outcomes Based Contracts and examines how an outcomes focus reduces risk and improves results in contractual relationships. Mobius is an outcome generation and delivery framework that is used to create the Target Outcomes in the Flexible Contract model. This free canvas helps you visualise the outcomes. Interview by Shane Hastie at Agile 2013 on Flexible Contracts, why they are needed and an overview of how they work. Slides from a presentation by Susan Atkinson at the Agile Business Conference titled “Effective Contract Metrics for Delivering Business Value” given in 2012. Slides from Susan Atkinson’s presentation for the Intellect Conference in 2012. This article attempts to explain the failure of the recent public sector healthcare projects in the UK and the US, and proposes an alternative form of management based on a style of management adopted by the military for use in warfare. Many IT change initiatives involving the development of software fail, and the scale of the failures can be large. 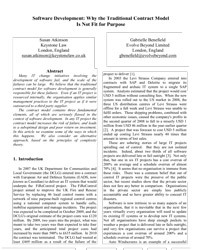 We believe that the traditional contract model for software development is generally responsible for these failures. In a guest blog for Campaign4Change, commercial lawyer Susan Atkinson argues that agile development is not an evangelical fad ill-suited to government IT. We live in fast moving times where the pace of innovation is exciting, but relentless. It can be daunting for anyone trying to keep up and it’s essential for contracts to adapt. With the credit crunch likely to affect every aspect of the global economy, the prospect of declining revenue threatens to erode the profitability of many businesses. 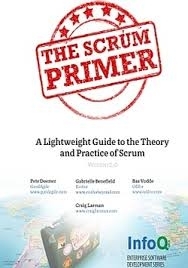 The Scrum Primer is an in-depth introduction to the theory and practice of Scrum. Its authors are Pete Deemer, Gabrielle Benefield, Craig Larman, and Bas Vodde.